With each variety separately crushed, fermented and matured, the Stray Mongrel displays the level of aromatic and flavour complexity you would expect from a blend of such diverse varietals. It is the perfect companion to a variety of culinary delights. 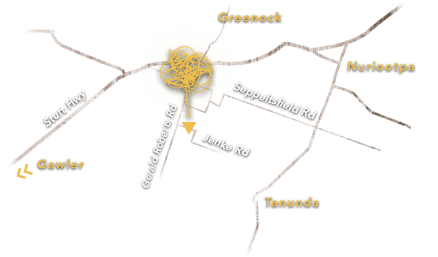 The Shiraz fruit is sourced from the ‘A’ block, on the Eastern side of Greenock Creek, with a Western aspect. The Grenache and Zinfandel vines are located on the Eastern facing slope of our vineyard. When founder Keith Hentschke purchased the property, this block was a quarry, and today the shallow soil profile overlaying the quarry limesone reduces the natural vigour of the vine, allowing vibrancy and intensity to shine in the fruit. growing season with flowering and subsequent fruit set 2-3 weeks later than recent vintages. Warm and consistent conditions followed with vines balanced and happy heading towards Christmas. A return to cool weather and rainfall continued the trend of slow development with veraison kicking off 4 weeks later than expected. After one last summer drop of 50mm in early February we got the weather we were looking for with dry conditions and good ripening throughout harvest. The vintage conditions have created outstanding flavour development and natural acidity with the resulting wines showing great poise and balance. The majority of all three varieties underwent extended maceration, with an average of 80 days on skins. The wines were pressed out to a combination of old French (70%) and American (30%) oak barrels where they underwent natural malolactic fermentation before being racked off lees and returned to oak to mature for a total of 8 months. Andrew Quin, Winemaker. Great aromatic detail in this wine with plum, blueberry, raspberry and toffee apple all getting a chance to shine. The palate is soft and even as is always the case with the Stray Mongrel. Expect layers of flavour that are similar to the nose although showing a little more bright red fruit. Texture, complexity and balance are the keys to this extremely successful blend.